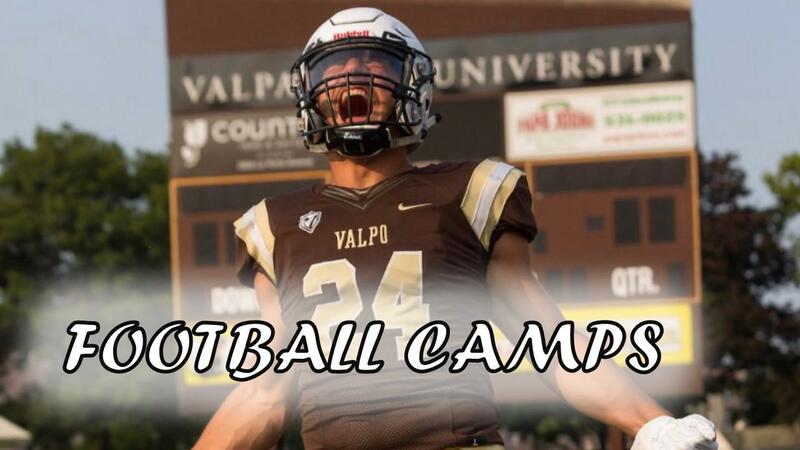 The 2019 Valparaiso Football Camps provide players entering grades 9-12 with a competitive and educational experience. Our goal is to improve every player who comes to our camp and help him become a better football player for his high school. Those attending the 2019 Valparaiso Football Camps will work with our experienced coaching staff. Sessions will be a balance of instruction, skills and game experience. Athletes will learn the latest methods in training & technique. Please note that if you are a Specialist please arrive 30 minutes earlier than camp start time! From the North: Take route 49 south towards Valparaiso. Exit onto route 30, heading west. When you see the restaurant Industrial Revolution Revolution on the right side of the street, turn right on Linwood Avenue. Take Linwood Avenue approximately one third of a mile until you reach the first stop sign. Take a sharp right turn onto Union Street and proceed to the next stop sign. Brown Field is located right behind the ARC at the corner of Union Street and University Park Avenue. From the East: Drive west on route 30. When you see the restaurant Industrial Revolution on the right side of the street, turn right on Linwood Avenue. Take Linwood Avenue approximately one third of a mile until you reach the first stop sign. Take a sharp right turn onto Union Street and proceed to the next stop sign. Brown Field is located right behind the ARC at the corner of Union Street and University Park Avenue. From the South: Take I-65 north from Indianapolis. Exit onto route 30, heading east. Drive approximately 15 miles east towards Valparaiso. When you see the restaurant Industrial Revolution on the left side of the street, turn left on Linwood Avenue. Take Linwood Avenue approximately one third of a mile until you reach the first stop sign. Take a sharp right turn onto Union Street and proceed to the next stop sign. Brown Field is located right behind the ARC at the corner of Union Street and University Park Avenue. From the West: Drive east on route 30. After passing I-65 in Merrillville, continue driving approximately 15 miles east towards Valparaiso. When you see the restaurant Industrial Revolution on the left side of the street, turn left on Linwood Avenue. Take Linwood Avenue approximately one third of a mile until you reach the first stop sign. Take a sharp right turn onto Union Street and proceed to the next stop sign. Brown Field is located right behind the ARC at the corner of Union Street and University Park Avenue.